The tournament will feature thirty-two (32) teams from Nunguaand Pokuase in the Greater Accra Region, Akim Oda in the Eastern Region and Takoradi in the Western Region. Each region will field eight (8) community football teams. The teams will complete in several games over the one-day tournament with the top three placed teams in each region sharing a total prize purse of GHS 5,000. The champions of each region will walk away with GHS 2,500. In addition to the action on the field, fans will be entertained off the field with table tennis, foosball and other exiting games. “Since our inception, we have been committed to sports development in the country and that’s just what we are doing,” said Magnus Rex Danquah Jnr., Country Manager of BetwayGhana. 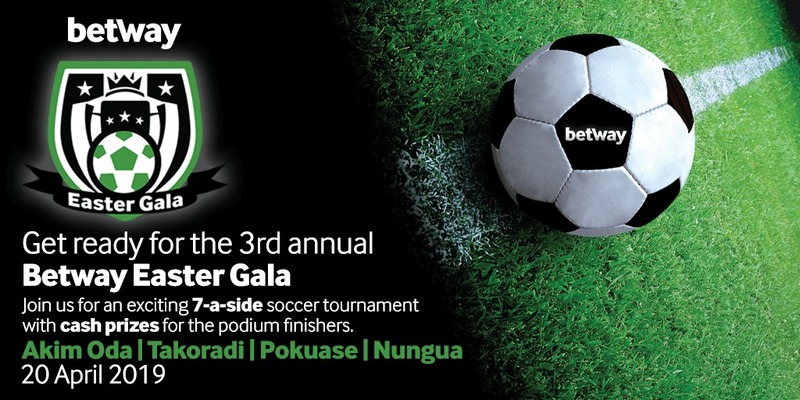 The 2019 Easter Gala will be the third sponsored by Betway in their continued drive to support sports development in Ghana.